Shambhala Mountain Center, the name alone brings an air of peace and tranquility; a welcoming place where Buddhist spirituality is brought to our modern lives in hopes of conscious awakening and ultimate enlightenment. For close to forty years, this 600 acre Colorado mountain valley center has represented one of the basic truths of Buddhism: that people can be profoundly open to the wisdom of the present moment. In accordance with ancient tradition, Shambhala Mountain Center seeks to create an enlightened society where it is understood that humans inherently possess wisdom, compassion and goodness. The Center also boasts hundreds of expert led programs on Buddhist meditation, yoga, and contemplative disciplines. Each year, Shambhala Mountain Center reaches out to a very special and beautiful group of people, women who have been touched by cancer. On August 26, 2009, women around the world are invited to the inspiring and life changing fourth annual Courageous Women and Fearless Living Retreat. Shambhala Mountain Center’s team understands the burdens and hardships of cancer; it is an experience that can take the mind and body captive, leaving the victim feeling helpless. They know this invasive disease can be traumatic for earth’s nurturing life givers, so much so that it leads them to question their uniqueness as a woman and who they once knew to be. This is why the Courageous Women and Fearless Living Retreat is so very important. It is about understanding that you are not your cancer and your cancer is not you; and that this experience can be translated into a life awakening. With guidance and companionship, women will understand that there is a world of resources inside of them, and they are well equipped to travel through and beyond the cancer; empowerment lies within. 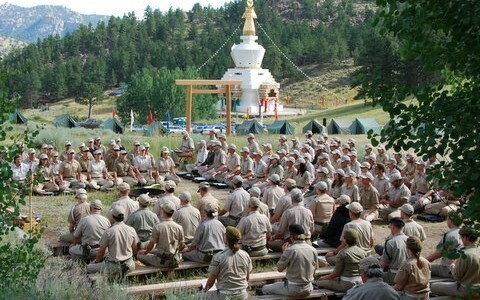 The retreat aims to integrate the mind, body, and heart in a way to meet experiences fearlessly and courageously. (View pictures of the retreat) The Courageous Women and Fearless Living Retreat is headed by four very compassionate, accomplished women; each shedding light and wisdom into their own personal areas of expertise. They will provide insight in areas such as meditation instruction, healing visualization practice, yoga sessions, whole-being health care and nutrition tips, small group discussions, art therapy, ritual, sacred dance, and community building. For over thirty years, Shambhala’s senior teacher Judith Leif has been sharing her knowledge of meditation and breathing techniques. Judith has a gift for bringing meditation to life by introducing the awe inspiring healing powers of presence. In the essential area of integrative medicine is MD, Victoria Maizes. She offers her expertise on nutrition, herbs, and supplements while also touching on the side effects and mind-body interventions of conventional cancer treatments. Teaching women how to regard their body with kindness and grace is impassioned yoga instructor Linda Sparrowe. Linda will lead transformative yoga sessions throughout the retreat, teaching new mind-body concepts along the way. One last woman leading the retreat is Sofia Diaz, a seasoned student of sacred movement. Sofia acquaints women with the art of temple dance, promoting the celebration and beauty of the feminine spirit. Another woman of much deserved mention is fashion designer Eileen Fisher, who has generously donated $6,000 worth of scholarship money. This donation makes it possible for women with other financial obligations to attend the retreat. Sadly, the Courageous Women and Fearless Living Retreat is in danger of coming to an end after this year. Because Shambhala Mountain Center does not want this beautiful tradition to die, they are working with potential attendees’ financial situations, with the understanding that not everyone can afford this retreat but should be able to experience such a life changing event. I strongly encourage you to investigate Shambhala Mountain Center and the Courageous Women and Fearless Living Retreat. It may be something you look back on as a monumental point in your life, an exalted experience. Be doused in love, wisdom, acceptance, and truth; be empowered, be woman. Experience Shambhala Mountain Center’s Courageous Women and Fearless Living Retreat.